Scott Walker is one of my all time heroes. But you all know that, right? I've probably driveled on about him more than enough for you to all know that.....although if you really don't know what I'm talking about and you really want to be bored, you could try this general eulogy poorly disguised as an appreciation of "Angelica", my entry for "W" in the Art of Noise A-Z or my review of "The Drift", where I compare the maestro with a couple of characters from the Fast Show. Anyway. Having established that we all already know what I think about Scott Walker, I'm going to ramble on about him again. For why? Because there was a programme on BBC1 this evening all about the great man. "For a time in the 60s Scott Walker was more popular than the Beatles. Then, one of the all time great voices of pop, he disappeared. Imagine... tells the story of one of music's greatest enigmas with insights from people such as Jarvis Cocker, Radiohead and David Bowie, and rare interviews with the man himself." Even a re-tread of Scott's career is going to be worth watching if it is illustrated with some clips from 1960s TV shows and filled with clips of that beautiful music.... and this programme certainly was that. We saw one priceless clip from Walker's primetime TV show: the show was given to him by the BBC at a time when he was at the very peak of his fame but was already moving into songs about existentialism and death and refused to sing any of his hits. 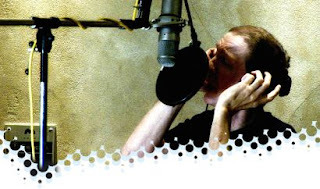 In the clip shown this evening, Walker shuffles up to a microphone and mumbles that "This is a song about a sado-masochistic relationship" before launching into a joyful version of Jacques Brel's "Mathilde". You don't get that on "Any Dream Will Do". The show was more than just a retread though, and what made it must-see television for me was that it featured an interview with the great man himself. Walker talked about his career, he talked about how he was terrified by fame and he talked about what he has been trying to achieve with his most recent records (we're not to take them so seriously, apparently... and when you actually see footage of his percussionist punching a side of pork for a track on "The Drift", you almost believe him... until you remember that it's a song about seeing Mussolini's body strung up on a meat hook next to the body of his mistress in Milan). I nearly missed that this was on, but luckily Mark and Lord B were both thoughtful enough to send me a message to remind me that it was on. What nice friends I have. It was a very, very interesting programme. The man is a legend. It's a word that's bandied about a lot, but for once here's someone who genuinely deserves the accolade. The talking heads on the programme (Brian Eno, Radiohead, Jarvis Cocker, Marc Almond etc.) were all suitably reverential, although it was nice to hear David Bowie listening to "Big Louise" and chuckling at one of the lyrics, which he declared "wasn't one of his best". He's not a God. As Walker himself said, he was sure he was failing more than he was succeeding, but at least he was trying. Amen to that. 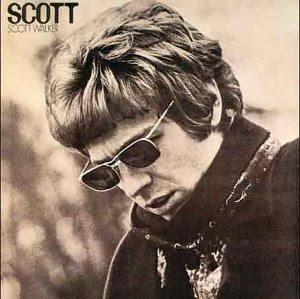 If you haven't heard any Scott Walker records, let me implore you once again to go and seek some out. The obvious places to start are with those 4 magnificent albums from the 1960s: Scott, Scott II, Scott III and Scott IV. And what did Lulu have to say about this great artist? "Is he still cute?" No wonder he became a recluse. I now really need to go and see 30 Century Man. I also really want a good Scott Walker t-shirt, but I somehow don't fancy my chances of finding one. I know it may seem a bit obvious, but, could you not create one? Those T-shirt shops can do marvels with a bit of artwork and, if you're really clever, you get a discount for having 10 or so done, and can then sell them on at a huge profit to people who see yours and say "Wow, where can I get one of those?" I'm back on the bloggersphere! I caught the last bit of that documentary. There was a song with lyrics, something like "I'm the last man alive, I'm the last man alive". Ghostly and scary. Very scary. I might see the movie.